While the team has been working on the field to get ready for the upcoming 2018 football season, the Clemson Athletic department has been updating and adding to Memorial Stadium throughout the year. These renovations and additions include new signage, prices on concessions, safety measures and improvements to the fan experience on gameday. In an effort to ensure that Memorial Stadium is the safest possible venue for fans during the 2018 season and beyond, Clemson Athletics, in conjunction with the Clemson University Police Department, will implement a walk-thru metal detector pilot program, a common practice at many major sports venues across the country. Select gates, rotating throughout the season, will have the walk-thru units outside of the stadium. For more information on how to be prepared, visit our Metal Detector guidelines page here. 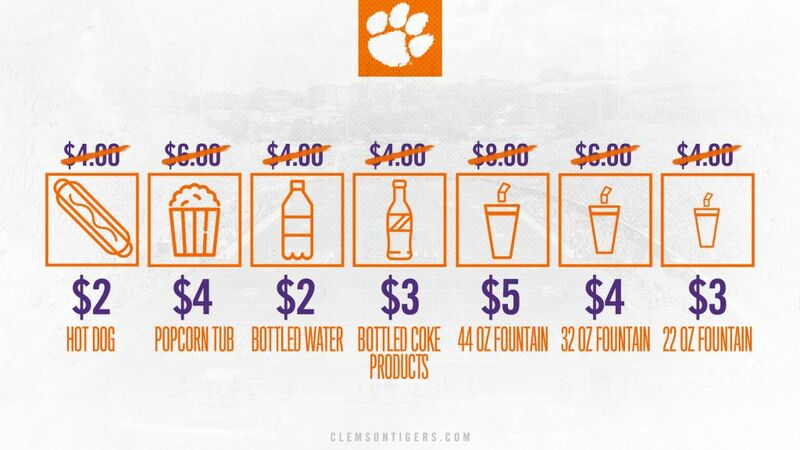 Convenient locations around the stadium to get new Clemson Tigers merchandise! 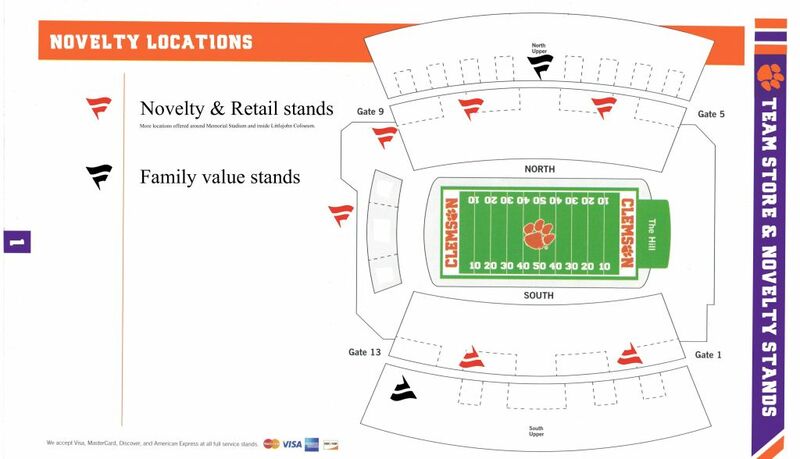 “Family Value Stands” in the map above denotes everything available for purchase in these select novelty stands is $25 or less. Signage commemorating the football program’s appearance in the 2017 College Football Playoff was added during the offseason. The drums at the base of the flagpoles at the top of the North and South upper decks house Memorial Stadium’s Distributed Antenna System (or “DAS”), which improves the cellular service during games. A new field goal net for the west end zone was added as a safety precaution for fans. Upgrades in technology in the form of new ticket scanners should support ease of access for fans entering gates at Memorial Stadium. Brand new fencing was added to these areas for aesthetic and fan safety improvements. The athletic department and Clemson University Police Department are piloting a metal detector program to ensure the safety of fans at Memorial Stadium. Select gates will feature the metal detectors at each home game and the gates will rotate every game. New gameday entertainment will include a new video to play while the team is riding buses around the stadium prior to running down The Hill and a new fourth quarter video to pump the players and crowd up before the fourth quarter begins. We hope you enjoy your visit to Memorial Stadium this season! Contact fanfeedback@clemson.edu with any questions or suggestions!